It looks like someone attacked this flower with pinking shears! The edges of the petals simultaneously appear to be spiky, yet soft. It reminds me of a sea anemone. This one goes on my list of “Plants That Were Probably Designed By Committee.” Which isn’t necessarily a bad thing. Au contraire, I think it’s a lovely, stunning, eye-catching creation. I just wish I could remember what it was called! 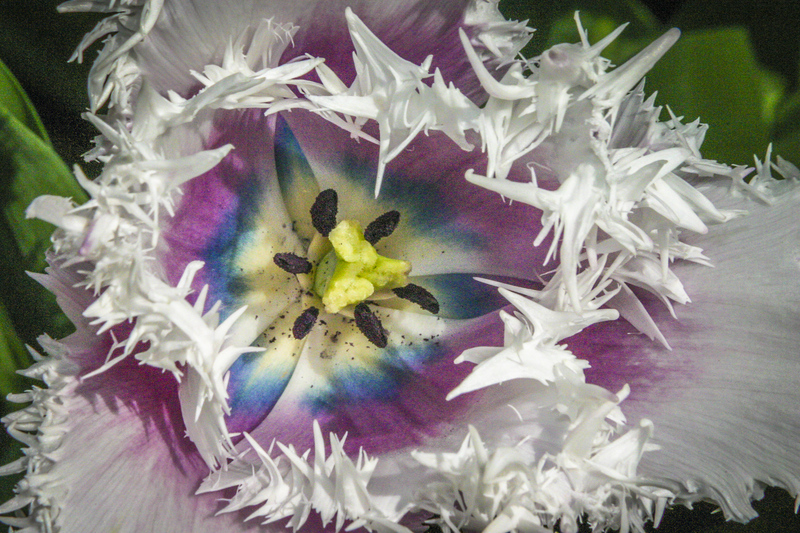 A natural flower “arrangement”…far more beautiful than anything I could’ve come up with! Cacti are fun photographic subjects. Whether I’m photographing a gangly saguaro, or a symmetrical barrel cactus, I can get lost in the variety of patterns the spines create. Sometimes they’re linear, sometimes circular, and sometimes you’ll find both patterns on the same plant. 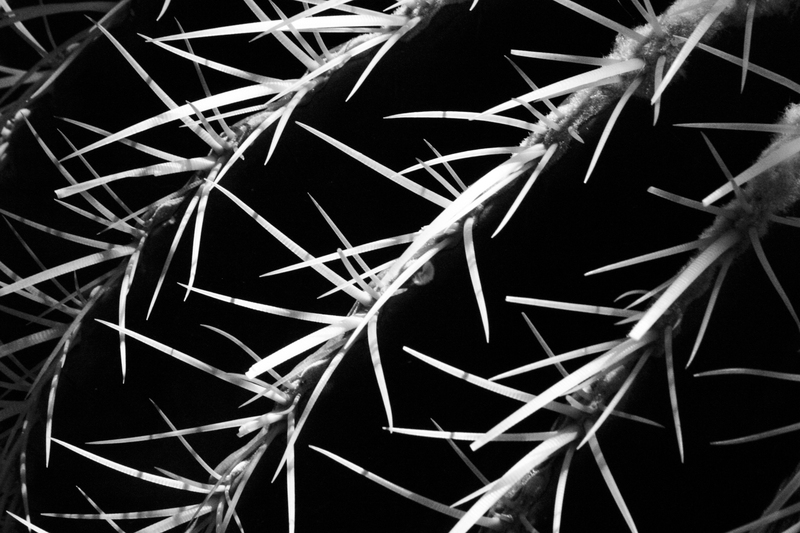 This was originally a color image, but I turned it into a B&W and bumped up the contrast to emphasize the pattern the lighter spines create on the darker body of the cactus. That made the spines appear to glow almost as if it were an IR (infrared) image, though it isn’t. I had a photography instructor once who stated that if a color image didn’t make a good black-and-white image, then it wasn’t a good photograph to begin with. He felt that color is a crutch that less practiced photographers lean on, and that having pretty colors in an image allowed photographers to be less diligent about composition, exposure, etc. I don’t agree with his philosophy entirely, but I’ll sometimes turn a color image into a B&W image momentarily to see if it indeed passes his test. Usually I turn the B&W image back into a color image, but sometimes I’m inspired to then desaturate the colors, since making that instantaneous switch from B&W back to color can make an image I initially thought was pretty suddenly look garish. And sometimes, as in the case of the image above, I decide it really should’ve been a B&W image all along. Thanks to the miracle of digital photography and editing software, it’s easy to have several versions of the same image to pick from. Today I choose black and white. 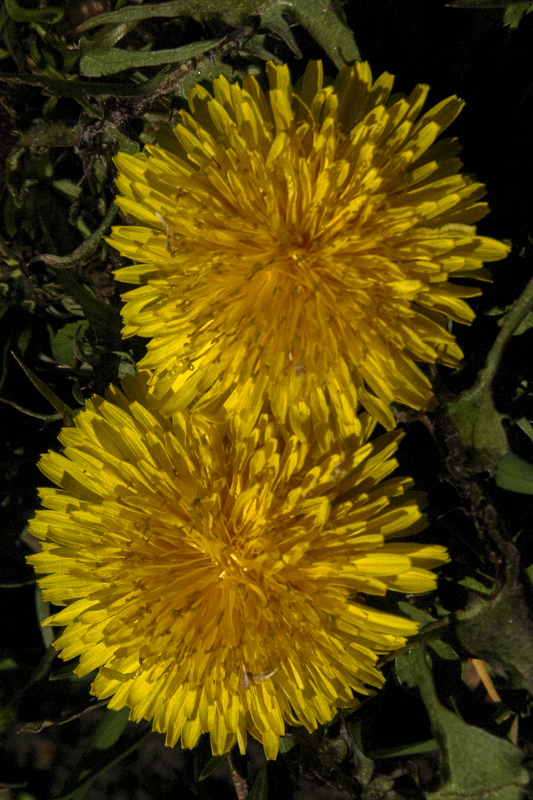 Unlike the bright red blossom in yesterday’s post (“Hard To Ignore,” 07.23.14), the lowly dandelion is easy to ignore…unless it happens to be growing in the middle of your dark green lawn, where its bright yellow blooms are sure to stand out. Have you waged a war with dandelions? For a small plant that grows only a few inches tall, it can be incredibly tenacious. It has a strong taproot several times longer than the plant is tall, and if you don’t pull up the entire root, the dandelion grows back, again…and again…and again. So you can hate it, or learn to love it. I have a soft spot for show-off flowers. Anything that’s big, bright, bold, has a unique shape or coloring or smell…they all win my heart. 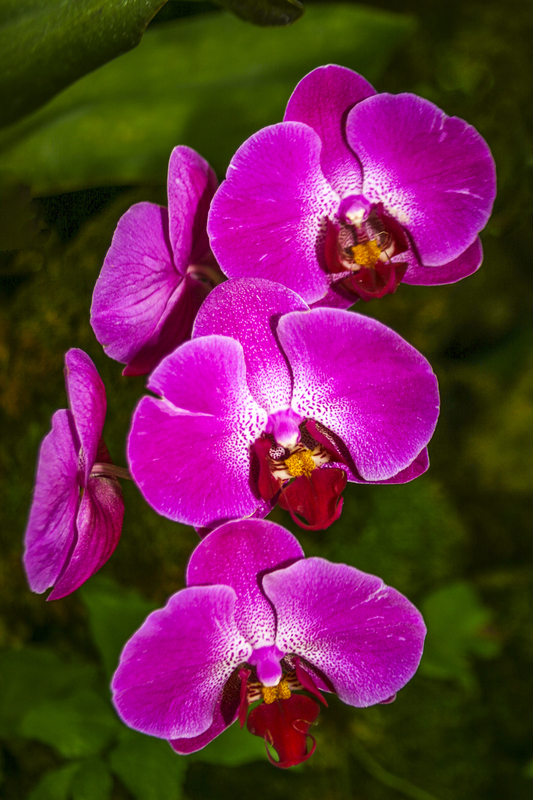 Orchids definitely are show-offs, and they make great photographic subjects as well. 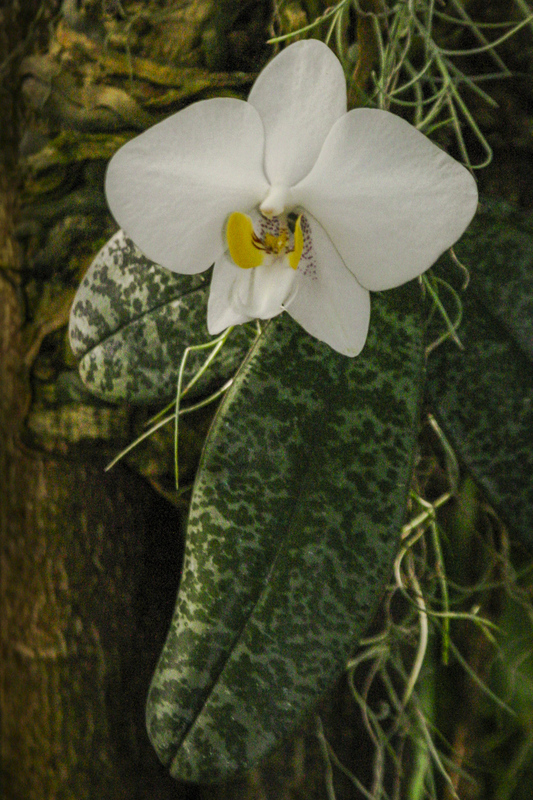 Yesterday’s image (“I’m Fanatical About the Botanical,” 07.22.14) featured a grouping of five orchid blossoms, and today’s post features just a single bloom dangling from the tip of a gracefully curving stalk. And of course any flower that’s red automatically falls into the show-off category. Bees aren’t the only ones drawn to this color! So there was no way I could pass up this baby, was there? One of my favorite places to photograph is in botanical gardens. I also love arboretums, conservatories, nurseries, parks, and anywhere else where it’s someone else’s job to tend the plants…the yards of my green-thumbed friends also make the list! A huge feature of gardens-tended-by-others is that they contain plants and flowers that are pretty, but too challenging for me to grow. Orchids are probably at the top of my “Don’t try this at home!” list. 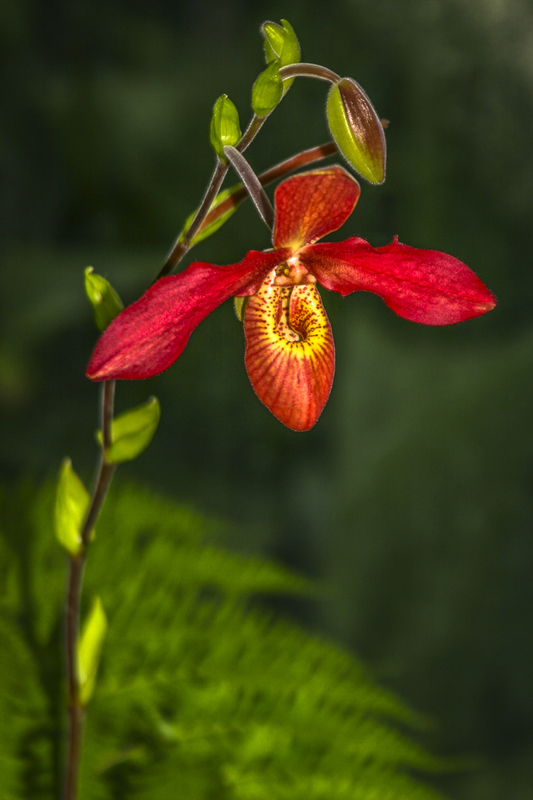 I had some success with cymbidiums, which are among the easiest orchids for beginners to grow, and that was about it. So I can’t resist the chance to shoot lovely, well-tended plants. It’s become such an obsession that any time I travel to a new geographical region, visiting a local botanical garden is imperative. Yes, you could say that I’m fanatical about the botanical! There’s been such a profusion of color in the series of posts about produce that it’s a bit jarring–to me, at least–to see a black and white image. This is a shot I took back in 2005, shortly after I went digital, and before the big HDR craze hit. Photographing a backlit statue on a bright, hazy day with a totally white sky behind it just wasn’t working. 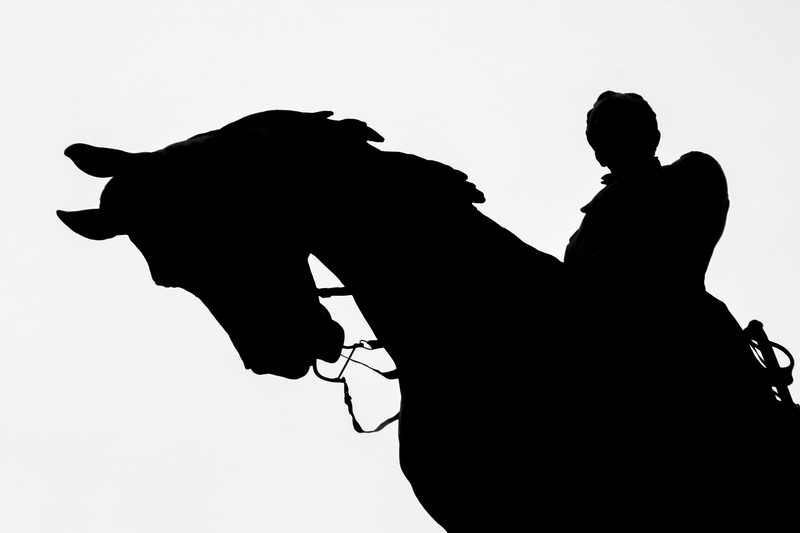 Even though I adjusted the exposure settings for the strongly backlit statue, the details in the features of the horse and rider were still fuzzy and dull. I tried a few different camera settings, and then finally gave up. Now, almost a decade later, it’s easy to tweak a few settings in some image processing software, and in under a minute, to create a more interesting photograph. If you have any backlit images that have strong graphic qualities and would make good silhouettes, give it a shot. Through the wonder of digital manipulation, you can create several versions of an image, and decide which one you like the best. Why is the word “produce” pronounced differently when it’s used as a noun than when it’s used as a verb? I have no idea! But I can offer some ideas on WHERE to produce images of produce. Probably my favorite is Farmers Markets. Often the growers are the ones selling the produce, and they’re usually very proud of their product and more than willing to let you photograph it as long as you don’t get in the way of paying customers. I like to go when the stalls are being set up. There are no crowds, and the displays are at their prime. You can often glean cooking tips from the vendors as well. They know no one will buy their produce who doesn’t know how to prepare it, so they’re usually happy to advise you. Some even hand out recipe cards! Farm stands are another good place to find produce displays. Something I like about Farmers Markets and farm stands is that I can usually shoot using only natural light, which is my preference. Keep in mind that vendors and customers may not take kindly to being repetitively blasted with a flash. But don’t overlook your local grocery store. I’ve taken images inside chain grocery stores that have I have shown and sold in juried shows and in galleries. Food festivals are another possibility, as there are often displays of whatever fruits or vegetables are featured, as well as various versions of those fruits and vegetables prepared a myriad of different ways. There are also usually heirloom or heritage varieties of fruits and vegetables that you might not otherwise see. Have you ever been to a tomato festival, or an apple festival? That’s when you realize how little variety the chain grocery stores typically carry. They select their produce based on varieties that ship well and have a long shelf life, and those are often NOT the tastiest OR the prettiest! 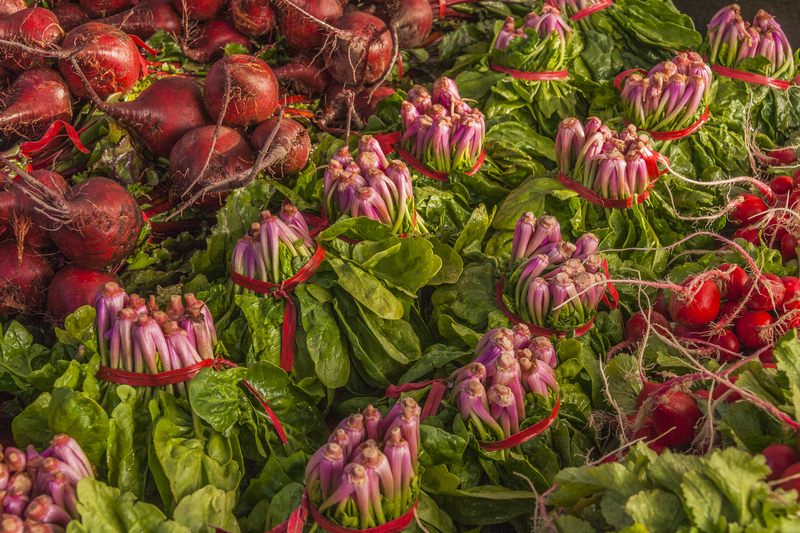 Do you have any other ideas on where to produce images of produce? If so, I’d love to hear them, and I’ll bet that other readers would too. Please share! 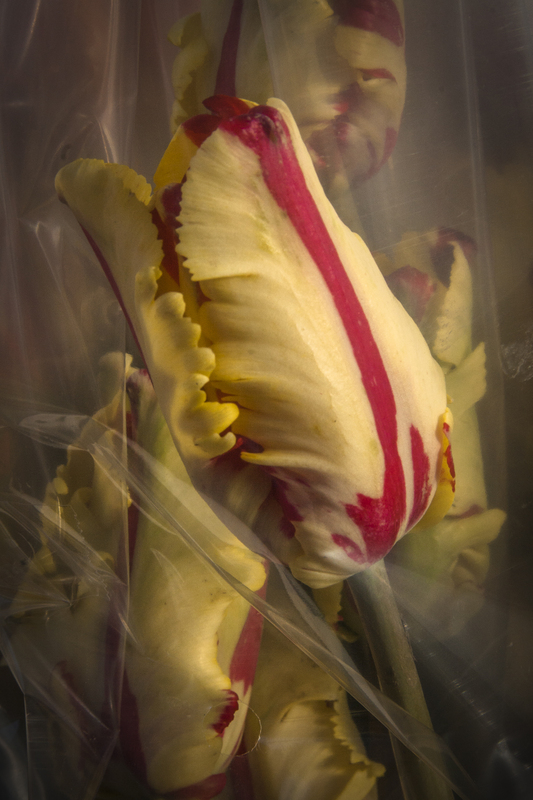 I found these lovely tulips wrapped in protective plastic at a flower vendor’s booth at a Farmers Market. Since I couldn’t unwrap them, and I wanted an image of them from the side, my only option was to shoot them through the plastic wrapping. I grabbed one quick shot, but didn’t think I would ever wind up doing anything with it…until tonight. Knowing I couldn’t make the plastic film completely disappear from the image, I played around with bringing it out instead. I like the way the folds of the plastic resemble a sheer curtain, and how they echo the delicate folds of the flower petals. In the end, I think the plastic enhances, rather than detracts from, this particular image. 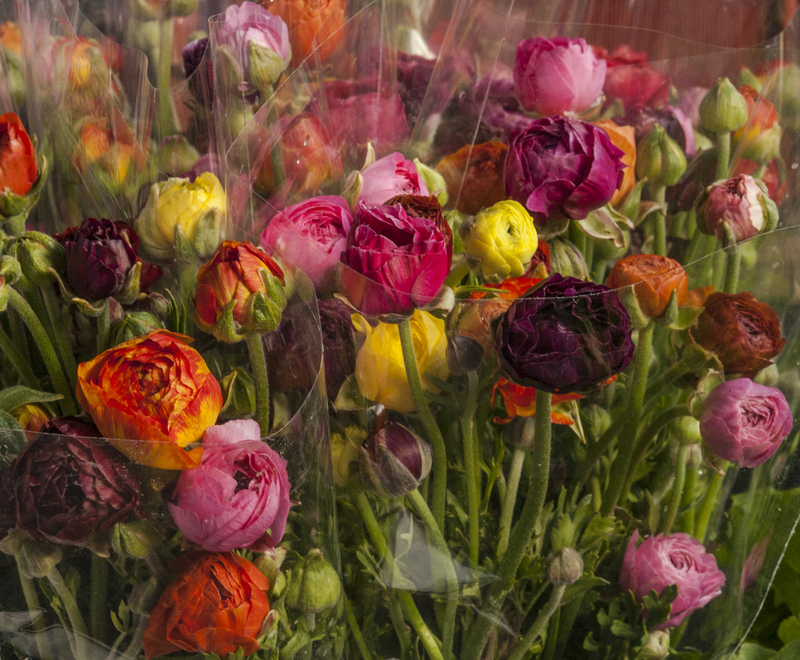 Though given a choice, I’d rather not have anything between my lens and my flower subjects. This title will make sense if you saw yesterday’s post (Peonies, Please!, 07.17.14). The image in yesterday’s post was shot looking straight down on the blossoms, and this one is a lateral, or side view. I think they’re gorgeous from either perspective!